It’s Friday, November 27, 2015 of the Wisconsin gun deer season. Not many hunters out and even fewer gunshots heard. I’ve hunted with gun and bow for 46 years now. I clearly remember that deer season meant “nine” days, not just opening weekend and maybe a day or two during the week, but nine days. It’s tradition! Hunters sure don’t hunt like they did years ago. I give my dad credit for all his guidance in teaching me how to hunt at a young age. I believe in never giving up. You have to put in the time and effort to be successful; learning hunting skills that only come with experience. The thrill of the hunt has never left me. I’m 57 now and was feeling my age on this cloudy November day. My wife and I got home late the night before. We went to the Packer’s Thanksgiving night football game and it rained the entire time. The drive home was intense; driving in rain, sleet and snow for almost two hours. I woke up Friday tired from the hunting season and the Packer game. I had some chores to get done and wondered if maybe I should just take a day off from hunting and rest, my body needs it. I got caught up on all my chores and now it was about 1:00 p.m. I felt exhausted. Work, hunting, and the Packer game all took a toll. But the deer hunter in me said go for a couple hours. Suddenly, I felt faint and my heart started to race. This was caused by a condition called SVT (supraventricular tachycardia) that I’ve been dealing with for 35 years now. (Recently, I had a procedure done that has finally corrected the problem). But, this episode was stronger than most. I felt myself going down on one knee and holding onto a chair for balance. It’s a bit scary, but in a few minutes my heart was back in rhythm. Feeling a little down from this problem, I had all the more reason to stay home. But instead, I started getting dressed to go out hunting for a couple hours. I grabbed my 30-06 Remington rifle and walked out my back door heading to my 40-acre woodlot. I live on my home place out in the country surrounded by farmland. Between my house and woods is a hayfield. The north end of the woods is a little bit swampy, so I go a little further into the woods. In my tree stand, I am wondering if I’m crazy for pushing myself so hard. Is this hunting that important? A couple hours pass in one of my favorite tree stands. While there, I hear an occasional crunch of leaves… steps of a deer walking… but nothing ever showed itself. So, I decided to make my way home, satisfied that at least I gave it a try. I climbed down from my tree stand and walked to the hayfield. I always like to leave my stand a little early in case there might be a buck in the field. It has worked in the past where I have actually gotten a couple nice bucks. As I approach the hayfield, it is empty. I can see my house a quarter mile away. I remember thinking, “This just might be the worst deer season ever. I have seen so few deer this season!” Since I have a little time yet, I make my way home along the edge of the swamp, keeping my eyes open for a buck. I’m half way home and about to check my trail camera which had captured a picture of a nice buck back in July. I just happened to look to my left across the hayfield and about 125 yards away I see a deer, a big deer! He apparently came out from a line of trees that I had planted years ago. The tall grass and trees must have kept him hidden so that I didn’t notice him earlier. It’s a nice buck. I calmly get my safety off, ready to fire. He turned quickly right, then left, hesitating as to which way to go; almost like he knew he was caught in the crosshairs. Boom! I fire. I named this buck awhile back. Although I never saw him, I had him on my trail camera for the past 3 years. I noticed from the time on the trail camera that he moved mainly around midnight, hence the name. I put my gun barrel ever so cautiously on his eye to test for life. He shook once very quickly and gave out his last breath in front of my eyes as steam came out from the bullet hole. I knelt down beside this magnificent creature that only God could create. I was in absolute awe of his beauty. 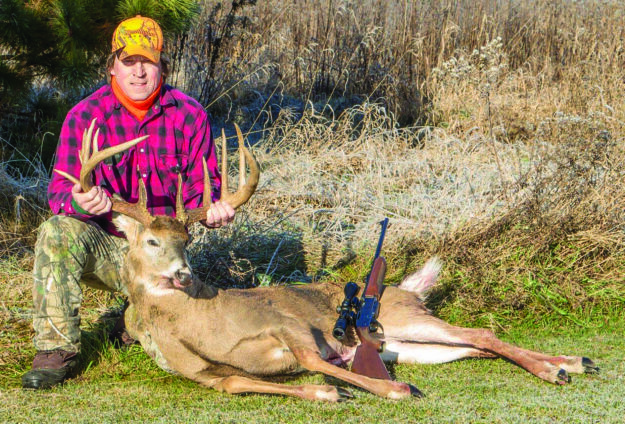 I bowed my head and gave thanks to God for the great gift he gave me, for the deer who gave his life for food on our table. It all brought tears to my eyes, what a moment, I am forever grateful. Captain Midnight was the #4 Typical taken with firearm in Wisconsin in 2015 and is the current #1 Typical taken by firearm for Marathon County, Wisconsin. Gross score was 194 4/8, net score 173 3/8, 14 pt, 21” inside spread, 25” outside spread, aged at 7 ½ years old, a Boone & Crocket. Truly, a buck of a lifetime! For more great hunting and fishing stories be sure to check out the best in everything outdoors Badger Sportsman!